Calibre CPA Group is co-hosting a Peer Discussion for Nonprofit Leaders on March 7, 2019 in Washington, DC. Calibre CPA Group Partners, Karen Roche and Lila Leno, will be representing our team at the event and during roundtable breakouts. The topic up for discussion is “Winning the Nonprofit Talent War.” The keynote speakers of the event are Ann Shipman, Director of Human Resources for the US Holocaust Memorial Museum and Joe Torella, President, East Region, at HUB International. 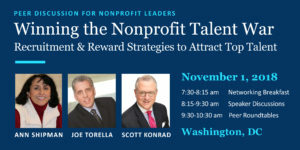 They will lead a discussion regarding the tough battle that charitable nonprofits are currently facing to attract and retain top talent.